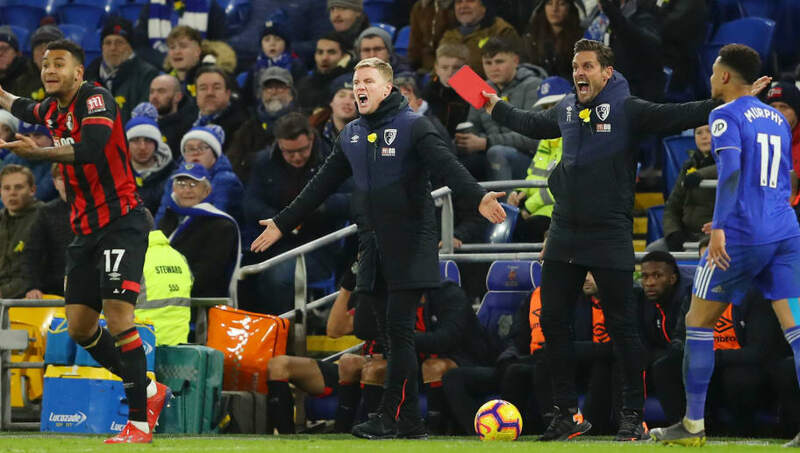 Bournemouth manager Eddie Howe criticised his side's "inconsistencies" following the 2-0 loss to Cardiff on an emotional evening in south Wales. Bournemouth went behind after just five minutes after defender Steve Cook inexplicably used his hand in the area - with Bobby Reid scoring the resulting spot kick. Reid was on the scoresheet once more just 15 seconds after the restart, condemning the ​Cherries to their eighth straight away defeat. Howe's men dominated possession in large chunks of the game but failed to create any significant chances - the best chance falling to Andrew Surman which produced a stunning fingertip save from Cardiff keeper Neil Etheridge. Speaking to the ​club's official website following the loss, Howe said: "It is hugely disappointing because we really wanted to build on what we had done. We felt that the result against ​Chelsea could have been a really good turning point for us. "We've been searching for consistency all season and we've never felt like we have fully broken that. We feel like we've really disappointed today. There is a lot of time to reflect now and focus on ​Liverpool, but we have to sort out our inconsistencies. That is going to be our biggest challenge. "Training ground work is important, but I think it is the mental side for us. You can't play like we did on Wednesday then come here and play like we did today. "The mental side for me had a huge bearing on today. It's not been the first time this season where you could probably question that within the team. We need to find the answers and I think a lot of that is just going to be out mindset going into games and how we're going to prepare. Today, we didn't get it quite right." The evening was tinged with sadness following the recent events that led to the disappearance of ​Cardiff striker Emiliano Sala and pilot David Ibbotson. The Bluebirds were playing in their first home fixture since the tragic news that their record signing had disappeared on a flight over the English Channel. Howe added: "It was a very unique atmosphere and a very unique, emotional game. I don't think I've ever been involved in a game similar to that one today, but the difficulty for me is that I have to analyse what was on the pitch. "I can't analyse what was happening around it. What I have to go away and do is reflect on what we've delivered from a football perspective." Bournemouth face a tough test at Anfield where they meet ​Liverpool this coming Saturday - looking to avoid their ninth consecutive away loss.